Two older punk acts are teaming up for a cross country summer tour that will have lots of older punks reliving their youths. 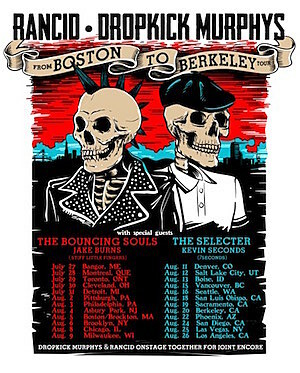 Rancid and Dropkick Murphy's are tag teaming for their co-headlining tour titled From Boston to Berkeley Tour which (obviously) will hit both bands home town. The full run down of the tour is here and both bands will be coming back out for a combined encore each night, which is cool. We have liked and seen both bands in the past and may try to catch the Brooklyn Boardwalk show.